In patients with advanced thyroid cancer, sunitinib, a drug approved for the treatment of several other cancers, has shown significant cancer-fighting activity in a new phase 2 clinical trial. Results of the single-center study were presented Sunday, March 8, 2015, at the Endocrine Society's 97th annual meeting in San Diego. "Sunitinib can potentially be used as an effective adjunctive treatment in patients with advanced differentiated thyroid cancer," said Principal Investigator Kenneth Burman, M.D., Chief of Endocrine at MedStar Washington Hospital Center, Washington, D.C. Differentiated thyroid cancer is the most common type of cancer of the thyroid, a gland in the neck. For patients with this type of cancer, surgery and treatment with radioactive iodine to destroy the cancer cells are very effective, but in some patients, the tumor will continue to progress. Dr. Burman and his colleagues tested the treatment effect of sunitinib in 23 patients with advanced-stage differentiated thyroid cancer who had undergone at least one course of radioactive iodine treatment. Primarily, they measured progression-free survival, the length of time that the tumor did not progress. They also measured the response of tumor growth to sunitinib using the Response Evaluation Criteria in Solid Tumors (RECIST). Patients received a starting daily dose (37.5 milligrams) of oral Sunitinib. The median progression-free survival was 241 days, or about eight months, the researchers reported. Because this was a Phase 2 clinical trial, there was no control group. The investigators compared their results against those of the control group from a recently published study in patients with the same type of cancer who received a placebo, or "dummy" pill. Compared with these controls, Dr. The St. Jude Children's Research Hospital--Washington University Pediatric Cancer Genome Project reports that a highly aggressive form of leukemia in infants has surprisingly few mutations beyond the chromosomal rearrangement that affects the MLL gene. The findings suggest that targeting the alteration is likely the key to improved survival. The research was published online on March 2, 2015 in Nature Genetics. The study is the most comprehensive analysis yet of this rare, but aggressive subtype of pediatric acute lymphoblastic leukemia (ALL) that occurs during the first year of life and is sometimes diagnosed at birth. The leukemia cells of up to 80 percent of infants with ALL have a chromosomal rearrangement that fuses the MLL gene to a gene on a different chromosome. The resulting MLL fusion gene encodes an abnormal protein. The fusion protein plays a key role in transforming normal blood cells into leukemia cells. Researchers used whole genome sequencing and other techniques to identify the genetic alterations in 65 infants with ALL, including 47 with the MLL rearrangement. Scientists were surprised to find that despite being an aggressive leukemia, the MLL rearranged subtype had among the lowest mutation rates reported for any cancer. "These results show that to improve survival for patients with this aggressive leukemia, we need to develop drugs that target the abnormal proteins produced by the MLL fusion gene or that interact with the abnormal MLL fusion protein to shut down the cellular machinery that drives their tumors," said senior and co-corresponding author James R. Downing, M.D., St. Jude President and CEO. "That will not be easy, but this study found no obvious cooperating mutations to target." Using a mouse model of rheumatoid arthritis, scientists have discovered that a form of cellular immunotherapy by intravenous administration of monocytic myeloid-derived suppressor cells, or M-MDSCs, might be an effective treatment for the disease in humans. In a report published in the March 2015 issue of the Journal of Leukocyte Biology, researchers show that M-MDSCs are capable of inhibiting T cell proliferation, as well as B cell proliferation and antibody production. As a result, the arthritic mice experienced improvements in their symptoms. The article was titled “Myeloid-Derived Suppressor Cells Regulate T cell and B cell Responses During Autoimmune Disease.” "I hope this study will lead to a better understanding of MDSCs' potential in cell-based therapies against autoimmune diseases," said Peng Liu, M.D., Ph.D., a researcher involved in the work from the Department of Medicine at the University of North Carolina at Chapel Hill. To make this discovery, scientists used T cell and B cell proliferation assays to test the suppressive ability of M-MDSCs isolated from mice induced with arthritis. Specifically, two groups of mice were used. One group was treated with control solution and the other group was treated with M-MDSCs isolated from mouse donors with arthritis. All mice received five treatments through intravenous injections. Arthritis scores and joint swelling measurements determined disease severity. The scientists found that the mice treated with M-MDSCs had significantly reduced arthritis compared with mice treated with control solution. Infection with highly contagious noroviruses, while not usually fatal, can lead to a slew of unpleasant symptoms such as excessive vomiting and diarrhea. Current treatment options are limited to rehydration of the patient. "Additionally, noroviruses come in a variety of constantly evolving strains. 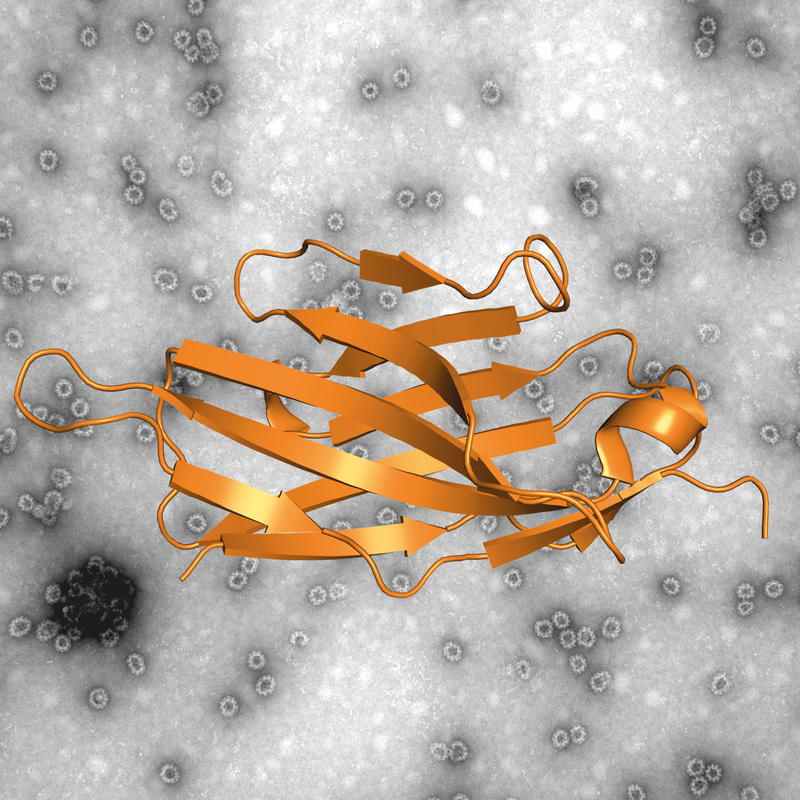 This makes the development of an effective vaccine to protect against infection, as well as antiviral therapy to combat already-existing infections, particularly challenging," says Dr. Grant Hansman, a virologist who leads the CHS Research Group on Noroviruses at the German Cancer Research Center (Deutsches Krebsforschungszentrum, DKFZ) and Heidelberg University. Dr. Hansman's research team recently discovered that a "nanobody" called Nano-85 was able to bind to intact norovirus-like particles (VLPs) in culture. Nanobodies are very similar to antibodies, which recognize and bind to antigens. "However, nanobodies are much smaller, more stable, easier to produce, and [more] cost-effective than traditional monoclonal antibodies," says Dr. Hansman. Interestingly, Nano-85 was able to recognize the VLPs from a variety of different norovirus strains. The results were published online on December 17, 2014 in the Journal of Virology. The article was titled “Nanobody Binding to a Conserved Epitope Promotes Norovirus Particle Disassembly.” The researchers then tested the nanobody on stool samples from patients infected with the virus. In this context, Nano-85 was able to detect virus in one-third of the samples already known to be positive for noroviral RNA. "Because noroviruses are changing all the time, there is a need for more powerful tools to detect emerging noroviruses. We still need to optimize detection using Nano-85, but we hope that it could potentially be used as a diagnostic tool further on down the road," explains Dr.